Halloween Windows – Kick Off Your Season – Painters! 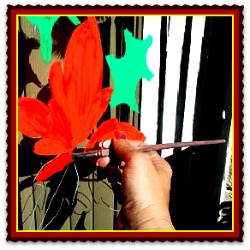 Quality Paint Brush sets are a must have for any Holiday Window Artist. Painting on glass requires a smooth flowing paint stroke. The better the quality the more reliable these needed tools will be and the longer you will have them. Higher quality paintbrushes stand up to their work better and tend not to loose bristles. A cheap brush will leave hairs all over you work, so take the time to select a good set. The smoother the brush the more fluid your lines will be. A softer bristle is composed of sable or squirrel hair. If you do want a rougher stroke for texture and effect a common 2″ paint brush will do great. In the set you set above right, there are several different brushes. The ones I use most are the Liner brush , lettering quills, and the fan brush. 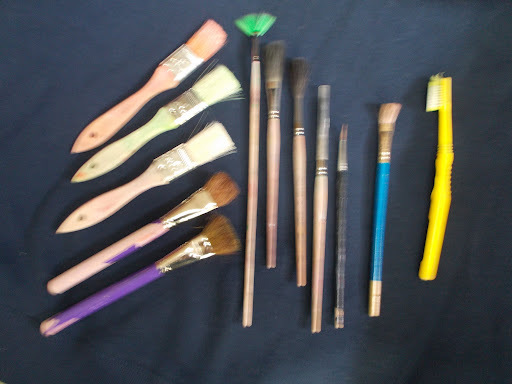 You see the 2″ brushes are stained in the color I use them with. This is important. Dedicating a brush to certain color shades prevents paint from bleeding in and ruining a light color such as white or yellow. It also will keep your greens or reds from being muddied. Take good care of these tools and they will last you for years. Read more….